Light It Up!! It’s a Knuckle Lights Review and Giveaway!!! | Todayz Run!!! ← Congratulations!!! Injinji Socks Winner!!! Light It Up!! It’s a Knuckle Lights Review and Giveaway!!! So, I was given the opportunity to try a product called Knuckle Lights. I am not going to lie, I am still pretty scared of the dark especially when I am by myself, so I was pretty excited to try the lights. A couple of years ago my sister and I use to run super early in the morning together. We seriously had every portable light we could find. We carried little flashlights, we both had headlamps, and we would even put a headlamp on her cute dog Daisy. (I think my sister might be afraid of the dark too!) The crazy thing was, is that we still could not see very good, and the deer that jumped in front of us still made us want to poo ourselves a little! I just don’t think headlamps and flashlights are all that awesome for running, but either are deer that jump in front of you!!! I have been using the Knuckle lights for a couple of months now and I have to tell you that they are my new favorite early morning running accessory!!! Oh, and every time I run with the lights I think about Ragnar, and how I am going to love using them during the night/morning (okay, dark portion) of that race for sure!! Last year during Ragnar my headlamp worked smashingly while I was waiting for my team-mate to come in, and then 5 ft. into my portion it blinked two or three times and didn’t work the rest of my run!! I guess it worked in my favor because I was so freakin’ scared I would haul to the next runner with a working light. This year with the Knuckle lights it will be amazing because I will be able to see the dead skunk on the road instead of almost tripping over it!!! 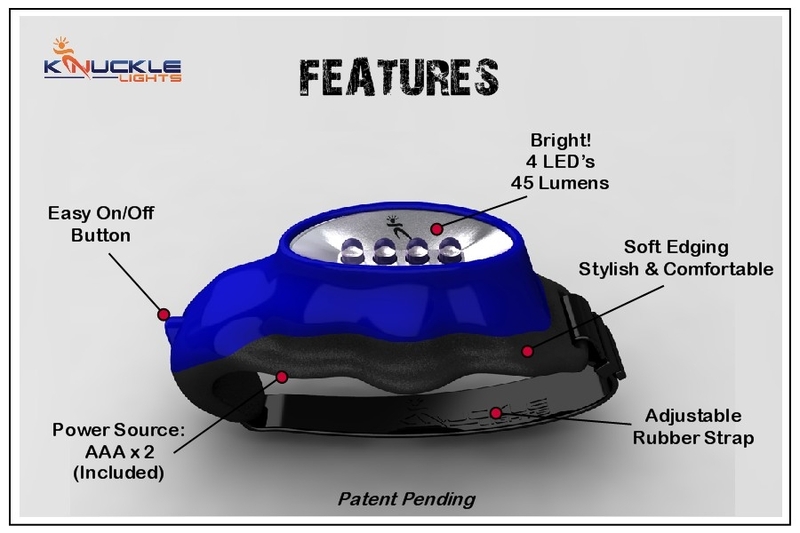 So do you want to hear more about the amazing Knuckle Lights instead of my mishaps running in the dark?……..Well okay then!! Here are the things I like best about the lights. They are super light first off, and the lights allow you to just have your hands in a very comfortable, natural way. You don’t have to do anything special to wear the knuckle lights. I have worn them with gloves liners, thick gloves, and with nothing at all. They will adjust to anybody’s hand. The very best thing though, is that they light up a large area around you. You don’t have to have your hands pointed in any direction like you would with a flashlight, and you don’t have to hold your head stiff worrying if your headlamp is going to slip. 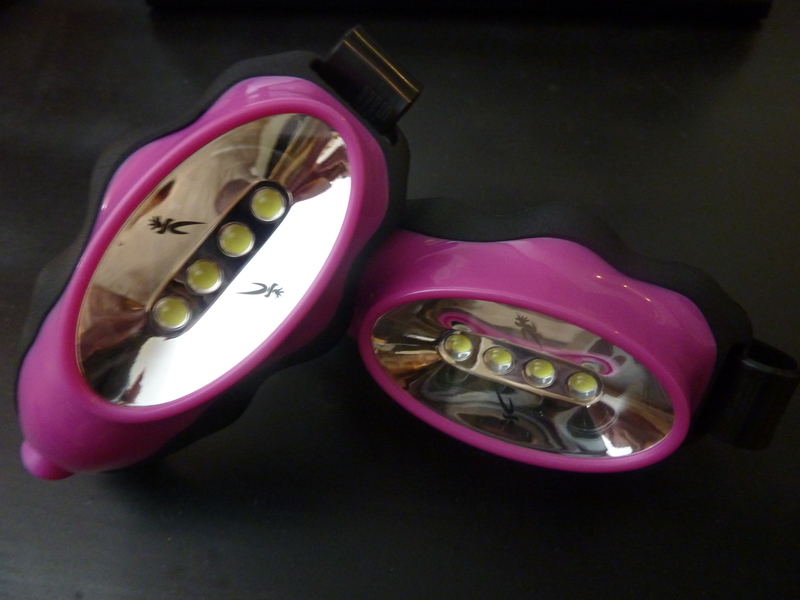 Do you want to light up your next morning run or all night relay with a pair of Knuckle lights? Well here is your chance! All you have to do is enter the giveaway!!! Light It Up!! It’s a Knuckle Lights Giveaway!!! Good Luck! You are so going to need it to win a pair of these awesome lights!!! This entry was posted in A Runner's Thoughts!, Everyday Running, Giveaways, Product Review and tagged A Runner's Thoughts!, Everyday Running, Giveaway, Product Review. Bookmark the permalink. 39 Responses to Light It Up!! It’s a Knuckle Lights Review and Giveaway!!! I’m a big chicken in the dark and right now I’m partnerless and have to run alone. And I’m starting to smell the skunks in my neighborhood! I would love to try the Knuckle Lights! I even love that on the website you can get them in different colors to match your running outfit 🙂 I think every runner that runs in the dark would try just about anything to make it safer to be on the street too so that traffic can see us! I love to check out your FB page everyday. I posted the link on my FB page. Please pick me. I went to their site and read their story, but I had the chance to see these at the Surf City expo and think they are definitely very cool! I’ve run on the Legacy Hwy trail a few times in the dark and I swear I almost got ran over by many bikers who couldn’t see me! (The headlight of the cars just blind you to everything else!) Would love a pair. I’m a fan of Todayz Run on FB. I’m so a subscriber! Would love these for my morning walks and runs! I went to the Knuckle Lights website. So did anyone besides me say to yourself “Why didn’t I think of these after reading their story”? Such a great idea and they might help your running form too. Maybe? I am a huge fan of Todayzrun on Facebook! Left a comment on Knuckle Lights facebook after I liked them. I put the link on my FB again. Posted the link on my facebook….these are super cool! I love the concept of knuckle lights and would choose the blue lights. I put the link on my wall today. I’m a subscriber!! Yey, thanks to Jen for showing me Todayz Run! I want the pink Knuckle Lights!! This would have really helped me when I decided to run in the dark on a busy road out in Hooper, (imagine no lights), with no sidewalk. Those holes in the side of the road were not very nice to me. I think they look so neat I would like to try them. I posted the link on my status. I also like nuckle lights on facebook. Knuckle Lights are a great idea. I like running at night but find that I am slower because I worry about tripping over stuff. I like that these lights do not require you to adjust your natural running position like a flashlight does; and no annoying headlamp. I “liked” Knuckle Lights on Facebook. Hope I win! “You light up my Life…… ” is that how the song goes … ? ?